But I’m getting ahead of my story. Way ahead . . .
During the months of June and July, I published a series of posts about moving from our large family home to a smaller abode. An earlier post discussed this move from my husband’s point of view: His Turn, an Artist Discards, Donates, and Discovers. I mentioned then that I may reveal later some of Cliff’s discoveries, unearthed drawings from an armoire that have not seen the light of day for literally decades. I’m showing the first one on this post. But first, some background . . . 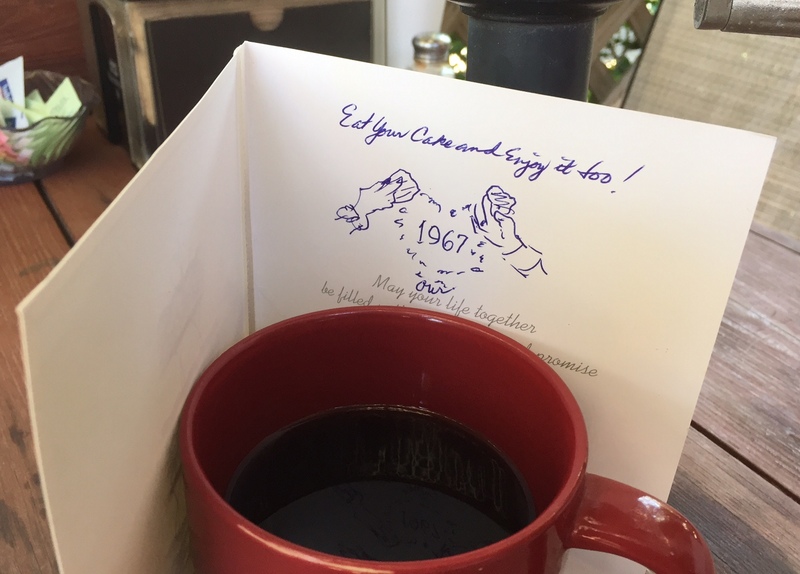 Through the ingenuity of my Pennsylvania neighbor next door, Paul Mumma, I met Cliff, his college roommate, as a blind date on December 18, 1965, a fact I recorded in an entry with many embellishments in my journal. My iPhone says the day of the week that year was a Saturday. A few days later, he had me pose in the living room of my parents’ home for many minutes. He explained that he was drawing my portrait. I sat very still for a long, long time. Cliff finally flipped the paper to expose the drawing. I was aghast when I saw what the clever artist had been playing with on paper for forty-five minutes: He had morphed my then-slender figure into a porky jungle animal with a cute blue bow. He laughed heartily when he saw my shocked reaction. After the gasp, all ll I could manage was an incredulous giggle. “You got me,” I thought. Really? What’s that like, I wondered. About a week later, Cliff drew a proper picture of me. He drew a good likeness of the serious me and prophesied my future, I think, by exaggerating my pile of dark hair and miniaturizing my prayer cap. He signed it, Love, Cliff. Yes, Reader, I married him. Our wedding was not quiet. And more than four people were present. 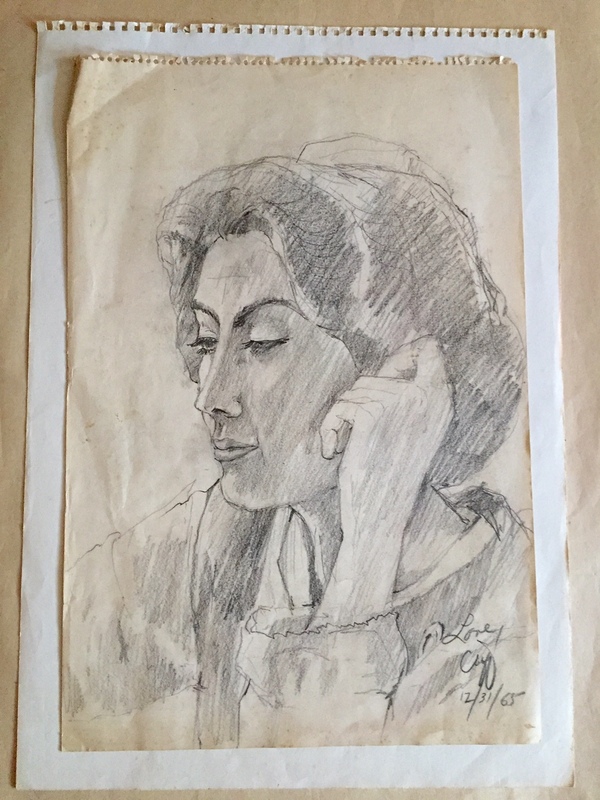 A few weeks ago when Cliff pulled out piles of papers and other drawings including the one above, a small bag fell out from one of the crevices in the same art armoire. The envelope was dusty but well-preserved after years in hiding. Inside he found an anniversary card he apparently had bought in his travels and had been intending to give me about 10-15 years ago, so he imagines. Time had preserved the lacy layers. But he added a fresh, new message. Dear Reader, have you ever found lost or long-buried mementoes of sentimental value? Thank you for adding your discoveries here. Oh my! This is so sweet, Marian. It’s a perfect antidote to the mood I’m in reading the news. It’s so wonderful that you have all these mementoes. All the best in your new home where I’m sure you are already making memories. We feel like a pair of Dodo birds right now – not making many memories at the moment but glad to have the move in our rear view mirror. We have floated a few metaphors, but right now the image of climbing Mt. Everest with a too-heavy backpack comes to mind. Thank you for supercharging these posts with your early morning energy, Merril. I thank you! I hope you have a less burdensome metaphor come to mind soon, Marian. Soon . . . very soon! Need time to recoup. Thanks for the hopeful wishes, Merril. I threw lots of stuff away but not the letters. My sister Jean has given a number of her letters from the 1950s and 60s from relatives (and even our pastor Martin R. Kraybill) to the Mennonite Historical Society in Lancaster, PA. They value highly such donations. Handwritten memorabilia from this era will be as hard to come by perhaps as medieval illuminated lettering since digital messages have replaced manual communication. How wonderful your “saved” letters carry the scent/personality of your parents – even the DNA, I imagine. What a legacy to pass on, Darlene! You really had no choice after that serious portrait, did you? And what a sense of humor in the elephant (I notice it wasn’t a donkey :-). Smart Cliff. Another great post, and many tantalizing hints about future posts. I think Cliff needs to draw another picture of you with Rosie the Riveter’s muscular arm as the inspiration. Many blessings on the other side of moving day, Marian. I know the work isn’t finished! Shirley, you can be sure Cliff will read your comment here, a perfect antidote/suggestion to the rigors of moving. Drawing recharges his batteries the way reading/writing recharge yours and mine. Right now all batteries at this residence have a pretty low reading. I honestly don’t know how you survived moves in the double digits, especially since you are a book collector, like me. But it moving means following one’s dreams or assisting others’ – so be it. Although I love the second portrait, the first is so endearing. Displaying a playful side is so important in a relationship. My grandmother’s journals has been my greatest sentimental find. Fabulous find – your grandmother’s journal, both historical and sentimental in value. I wonder whether you have written on your blog about them. I’ve been haphazard in keeping up with your posts lately. Maybe things will stabilize soon. I do know you are under contract for your next book. Thrilling. Jill! No worries…you’ve been busy. Yes, I did write about it on my blog, Marian. I also referenced it in my book. My heroine reflects on discovering the journal. Now I’m intrigued. I’ll do a search on your website. Nice way to bind the past to the present point of view! Ha Ha Marian! Thanks for the laugh! I would have fallen head over heels in love/like/love/like immediately! And the 2nd drawing is precious. 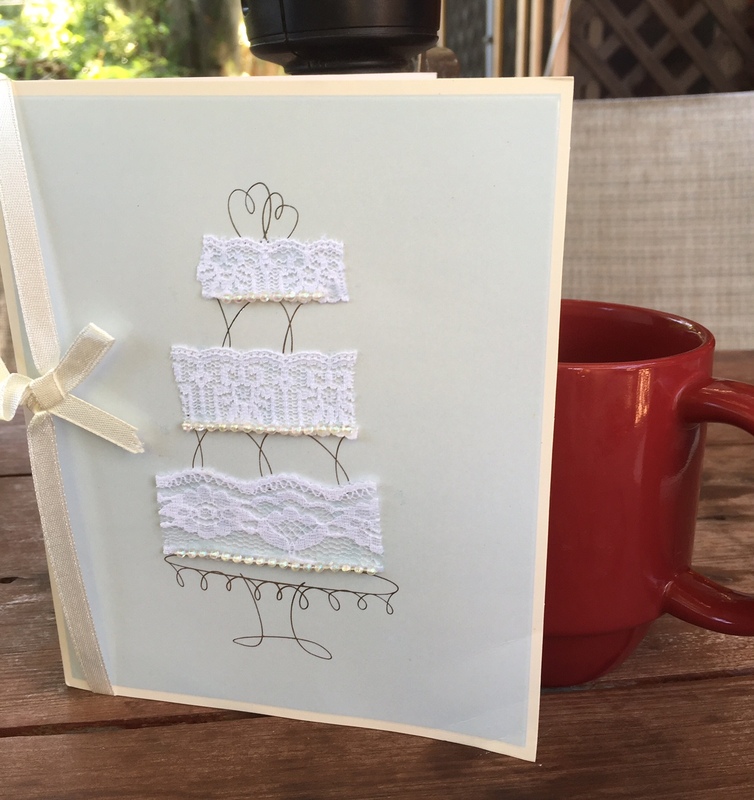 I love the anniversary card – I can almost touch and feel the lace. I’m having a few more shelves built next week to put all those precious mementoes somewhere safe and accessible. I’m nostalgic for it all – your post has reminded me. You are such an astute reader, appreciating all the sensory details, intuitive for a writer like you. Your comment about the full moon reminded me of Frank Sinatra’s rendition of “Blue Moon,” precious and sentimental as they come. Thanks, Susan! Kathy, this is the most taxing thing we have been through in a long while. On a stress inventory, it must be in the top ten. However, keeping in contact with friends here is helping me acclimate our new place because it feels familiar. Learning different rhythms and acquiring a new sense of place is our next challenge. But you know all about challenges, Kathy. Your high spirits are an inspiration to us all. I think of you daily and lift you up in prayer . . . even see you typing just now with the fingers of your left hand. Bless you! Transitions – oh, sometimes they are toilsome and tiresome as we both are experiencing just now. I raise my candle/glass/hand (Take your pick) to brighter days ahead for each of us. We have to get those memoirs written! Yes, even the movers noticed. I don’t think they move people with an art collection very often. And, yes, Jenn, it’s a keeper, but hard to preserve as it was done on newsprint, not very durable. Thank goodness for digital imaging! Lovely, Marian. How could you resist a man who courts you in such an artistic way? You are right, Carol. I couldn’t. If two words could define my Mennonite upbringing they would be straight-laced and naive. Except for the laughs I heard in Grandma’s kitchen and jokes from a few light-hearted relatives, the tone at home was very serious. Obviously, I intuitively recognized what was missing, and took the bait hook, line, and sinker. Thanks for our insight, Anita. Actually, I was too naive then to be hurt or mad. Stunned would be the better word. I agree, along with strength of character, a sense of humor goes a long way toward smoothing out the bumps in the road. Oh my! Such treasures–the ephemera AND the artistic hubby! You have an eye for art too. I love how you are blending text with photography and justly getting recognition for it on your own blog. Yes, they are treasures indeed – thanks, Linda! Marian, I shared this post with my husband and we both had a good laugh! He especially identified with the misplaced anniversary card. What a great post! There are so many wonderful stories out there, but you have to know how to tell them! You do a great job! I’m glad you enjoyed this – and shared it with your hubby. I wonder if he is prone to misplace and forget things too. It sounds like you are a great (and complementary) team. That drawing of the real you is very glamorous. I love finding things like this and am looking forward to days I can go through things and rediscover them. A colleague is moving right now also and she was aghast to find a fanny pack (remember those?) that she saved from a 1997 Mennonite youth convention and moved with her to California, to Indiana, to D.C. and to Ohio, now wondering why she found it that special. That happens too! I’ve found some old and questionable items too – many with a moldy finish. Ugh! I thought I could never part with my lesson plans and teaching files some that smell musty, but they have been consigned to the recycling bin. There they shall stay. I believe the L. Lewis means Lora. Right? Happy to see you in this space and thrilled we have reconnected after all these years. Before I brought my retirement scrapbook to the new place, I re-read your card and heartfelt message on pretty green paper. Whether you remember what you said or not, your sentiments touched my heart. Thank you – again! What a great post of new beginnings, in 1965 and new beginnings all these years later. More than that the great love and great sense of humor. Things that sad to say this generation may not experience. I laughed at the picture of the animal. Very cute by the way. When I met my husband to be, his first gift to me was a big stuffed elephant. Lucky for him I only weighed 125 at the time or I would have been offended. First I have never in my life liked stuff stuffed toys I always seen them as germs. I never gave them to my children to play with. My first response was is this a joke is there a gold bracelet or a diamond ring in this fat ugly thing. I’m searching not looking at his face. When I did not find any jewelry I looked up at him and saw his face red and embarrassed. I felt bad that I never stopped to think how self centered I was. Lesson learned for both of us. Not to be selfish or to think of myself. He never ever gave me a stuffed anything or an appliance for the home. Now he just takes the kids to pick up something for mom. Your children and grandchildren are blessed to have the example of love you have for each other. 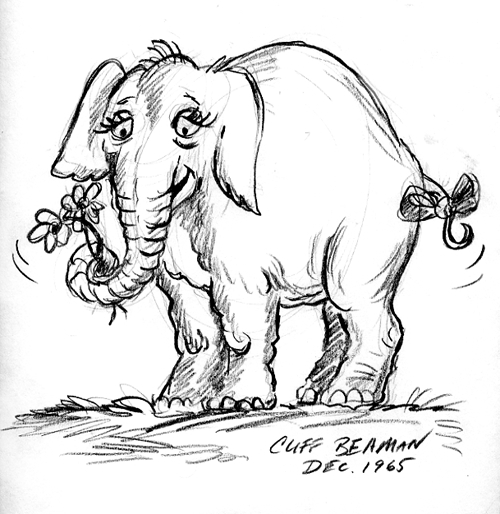 Marian — And while Cliff’s drawing of the elephant is adorable, the real portrait of YOU is incredible. Absolutely incredible! Clearly, another benefit of moving has been finding lost treasure. I don’t remember seeing this drawing since I first met Cliff. Yes, it is truly a treasure. “What other secrets are in hiding?” I ask. Thanks for broadcasting this on Twitter as you so faithfully do, my friend! What a delightful post, Marian. A true love story punctuated by surprises and excellent drawings. I could make up a story, but I’m better at non-fiction and as an artist I flunk. Glad you enjoyed this, Marylin. To refresh my memory, I went back and re-read this post and my comment and question “Did you tuck the note in your bra?” Of course you answered that in a profound sentence with the word “heart” at its core. When I saw the note I noticed the extra bold E and the signature V this time. What love-filled memories! Glad to hear the move is now over! What a job, Fiona, as you well know. It was way more energy-sapping than we imagined, but we are happy we’ve made the effort. I can imagine living here for many more years. Thank you for the good wishes. Nice memory share Marian. I think it’s beautiful you keep these precious mementos. I have every card my husband has given me. And there are 3 shopping bags full! They’ll probably be with me till the day I’m no longer. 3 shopping bags FULL! This sounds like the young lady who wrote Have Bags, Will Travel. I’ll pass the compliment on to Cliff. By the way, thanks for the Tweet too. Busy lady – Ms. Debby! I think you are related to my husband: You wouldn’t believe the baggage . . . Ah. Yes, you would! Several agree with your “take,” Rebecca, including Marie below. As a plain Mennonite girl back then, I welcomed excitement in any form, even at my own expense. My new artist “friend” sized me up correctly: naive and gullible – ha! I was in the mood for excitement in my life, so I accepted the elephant sketch as a clever gesture, not mocking. If I had been a fat girl, I may have – ha! I was a fat girl!